This article will tell you everything you need to know about air source heat pumps Scotland. This system takes heat from the outdoor air, this heat is then taken to the wet central heating system where the water is heated up. The heat produced is not as hot as a conventional boiler, so large radiators and underfloor heating may need installed. Air-to-air heat pumps take heat from the outside air, this is then fed into your home by fans. This type of system cannot produce hot water. If you’re replacing an old heating system you could save anywhere between £290 and £1,090, depending on the fuel used. If you’re replacing a new A-rated boiler, then it may actually cost you more if you install a heat pump. How Eco-Friendly Are Air Source Heat Pumps? Air source heat pumps use a renewable and natural energy source (air) to heat up your home. The decrease in the amount of CO2 you will save will depend on the fuel source you are replacing. Air source heat pumps aren’t completely carbon neutral because they require electricity to power them. But for every unit of electricity used powering the pump, the air source heat pump could make 3x that amount back. If you’re looking to install an air source heat pump system, you may be wondering what is involved in the installation process. 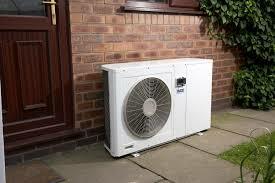 Air source heat pumps Scotland look similar to air conditioning systems. You don’t need to worry about air source heat pumps causing too much disruption to your garden, because unlike ground source heat pumps they do not require digging in your garden. In summer, some types of these systems can be used in reverse and can act as an air conditioning system.